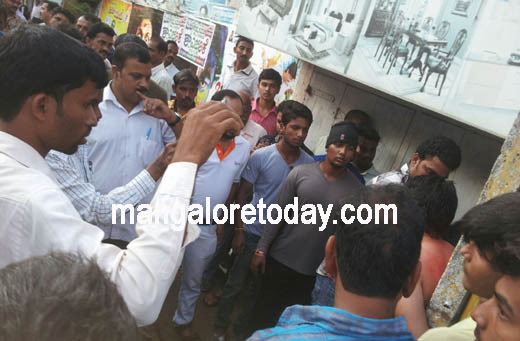 Mangaluru, August 24, 2015: ‘Moral Policing’ is still alive and kicking in Mangaluru. An young man travelling with a girl in a car was stoped, stripped, tied to an electric post, kicked and thrashed by a group of right wing activists at Babugudde, Attawara today, August 24, 2015. 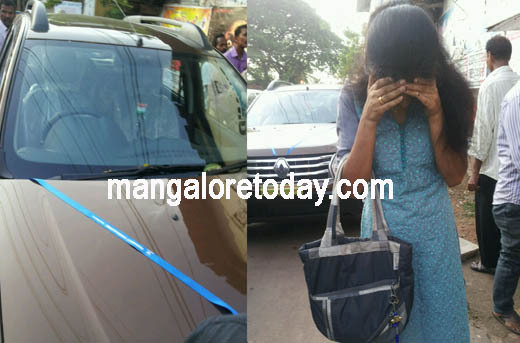 The incident occurred when the victim, Shamnaz (name changed) came to drop the girl in Babugudda when a group of activists surrounded the car and pulled him out and started abusing and hitting him. When the girl came out of the car, they abused her and warned her. The victing was dragged and tied to a post and manhandled and abused by the miscreants. However, the victim said that he had come to meet her at Babugudde to give her some money she wanted. He pleaded that he has no bad intention or any affair with the girl. It is learned that both the victim and the girl are employees of a mall in Attawar. The victim is admitted in hospital. Pandeswar police is investigating the case. The activist has to inform their family and leave the decision to the family. This not ’DEMOCRACY’ -Right to thrash in the name of religion. These days the Mangaloreans are just fighting in the name of religion. Are these people really concerned about the people or only time pass. Only the jobless people involve themselves in such act. Both have to be thrashed because the boy hadn’t kidnapped the girl. The girl had gone with him with her consent. In the name of moral policing the activist are disturbing the harmony in the minds of the locals. The people are creating problem in the name of religion.